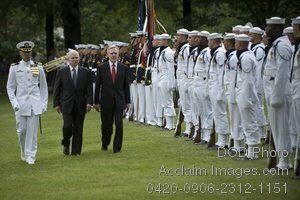 Description: Free, public domain image: U.S. Secretary of Defense Robert Gates and Secretary of the Navy Ray Mabus Review Troops for Swearing In Ceremony. U.S. Secretary of Defense Robert M. Gates, center, and Secretary of the U.S. Navy Ray Mabus, right, review the troops during Mabus? swearing-in ceremony at Leutze Park at the Washington Navy Yard in Washington, D.C., June 18, 2009. Mabus was sworn in as the 75th Secretary of the Navy during the ceremony. (DoD photo by Mass Communication Specialist 1st Class Chad J. McNeeley, U.S. Navy/Released.